A few months back I saw an advertisement pop up on my Facebook news feed for this Georgia Death Race (GDR) branded headlamp! Like any other race junkie, race gear is always something I want to try and experiment with to find what’s perfect for me. The more I’m involved with the different race groups on Facebook, the more I am realizing that everyone has an opinion on gear, and everyone wants to know what you think! I’ve gone through three different headlamps last season; none of them were bright and most of them were of poor quality. Me? I also use them for more than racing; mowing my lawn, washing my car in the fall evenings, and walking my dog at midnight. Being older, my eyesight is not the same as it used to be; I need the light, and the brighter the better. So, I figure I’d try one out! It was $40. I thought with the name and the price I’d be receiving a high-quality product. LED Service Life: more than 100,000 hours. It was delivered in a couple weeks… I opened the box and it was pretty! It’s Purple, I’m a girl, but it was bulky and plastic. Somehow, I ended up with 2 because of a computer glitch, but I almost felt like a sucker. I had to try them out and see what they could do for me so I immediately charged the batteries that were included and turned that sucker on! OMG! I was almost blinded by how bright it was! I went outside and could see about 75 yards in front of me, bright as DAY And with my big hair it held on and the battery lasted the 30mins I walked. I decided I wouldn’t charge it again until it started to fade. The next day I did a 5k and it held well didn’t bounce around and didn’t feel as heavy as it looked. I used them both – one for reading at night, the other for my outside activities. 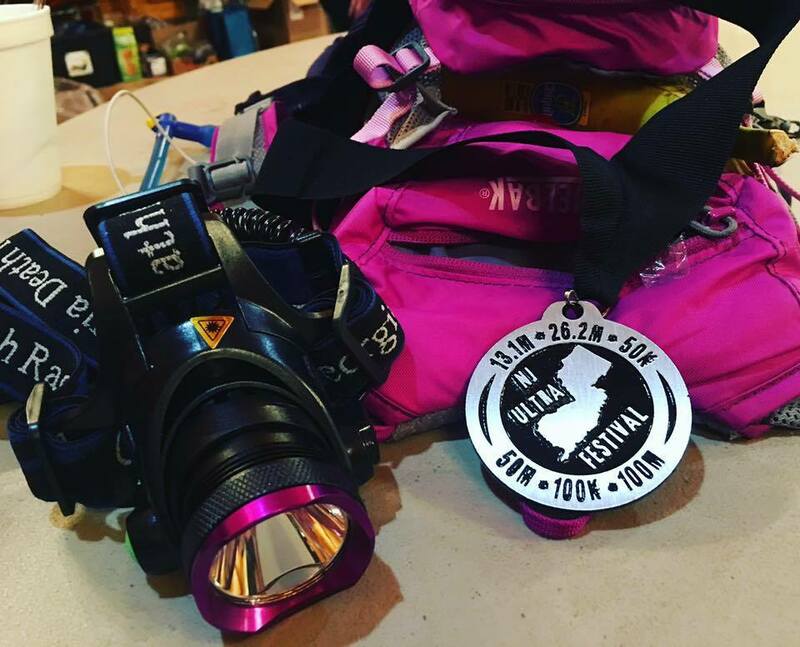 be a good test for my equipment for my upcoming race (NJ Ultra Beast). I wasn’t sure how long I’d be out and brought my GDR headlamp just in case. Good thing, my last two laps it was pitch black in the woods and I needed it! It was super bright as expected. I didn’t miss a marker nor a rock (or hit one for that matter). It didn’t move when I set the lamp going up and down the steep mountain, and stayed on my big head through seven tough miles. I was very happy but happier that no bear came chasing after me in the dark wondering what was shining its way through! Bottom line, I would get another! BTW, you can’t put a value on this, it was for charity!